Your ears, nose and throat help with important functions throughout your life, so when they aren't functioning normally, it can lead to serious problems. 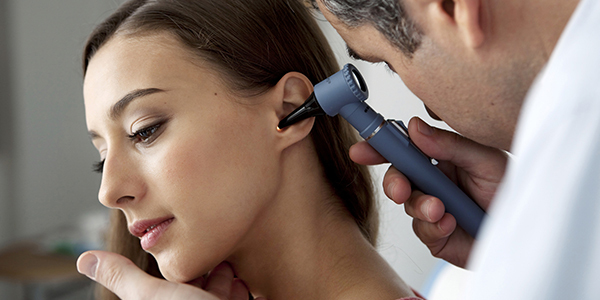 Because these parts of your body are connected, it's important to visit an ear, nose and throat doctor (ENT) to get your condition diagnosed and treated. 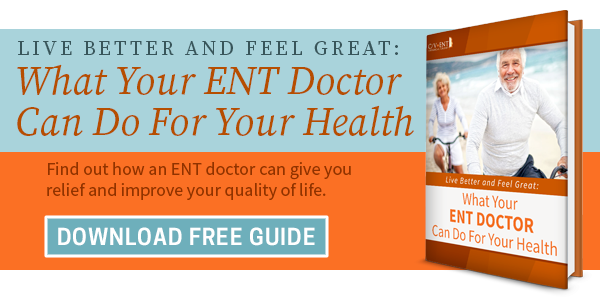 Read on to learn more about symptoms and treatments for the most common ear, nose and throat complaints. Ear infections are very common, especially in children. In fact, more than 80% of children are diagnosed with an ear infection before their third birthday. These infections result in inflammation and are usually caused by bacteria in the middle ear. Symptoms include a feeling of pressure or pain in the ear, a fever, dizziness, hearing loss, or fluid draining from the ear. Although ear infections usually clear up on their own, see your doctor if you suspect that you or your child has an ear infection. A serious infection may require antibiotics, and children who get recurring ear infections may benefit from surgical tubes to help the ear canal drain. Tinnitus is also known as ringing in the ears, and usually presents itself as a constant or recurring ringing, squealing, or roaring sound in the ear, even when no external sound is present. Tinnitus in itself isn't a disease but can be a symptom of other problems. Many cases of tinnitus originate from inner ear problems. Loud noises can cause damage to your inner ear, which can lead to tinnitus. Ear infections or pressure on the eardrum can also lead to ringing in the ear. 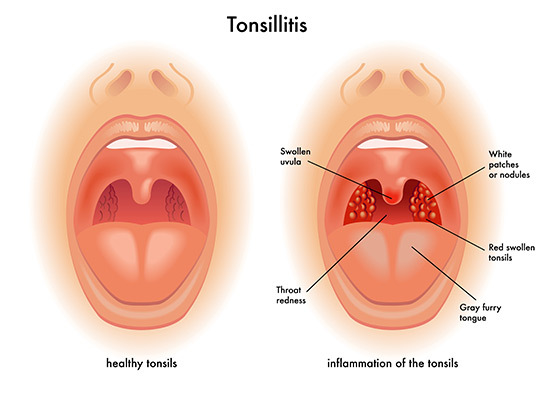 Tonsillitis is an inflammation of the tonsils, which are part of your immune system, found at the back of your throat. Symptoms of tonsillitis include visibly swollen tonsils, white or yellow patches on the tonsils, difficulty swallowing, sore throat, and swollen or tender lymph nodes on the sides of your neck. Sometimes tonsillitis is caused by a virus, while other times it's caused by bacteria. If the tonsillitis is caused by bacteria, it can be treated with antibiotics. Because problems like tonsillitis often occur in children, it was once common to remove the tonsils to prevent recurring infections. However, the surgery carries risks for complications, and more evidence is pointing towards tonsil removal having long-term effects on immune function. Sinus blockage can be caused by things like allergies, a cold, or nasal polyps (growths in the lining of the nose). All of these could lead to sinusitis. Symptoms of sinusitis include a stuffy or runny nose, sinus pain or pressure, congestion, fever, or fatigue. You should visit your doctor to find out the cause of your sinusitis and the best treatment, but over-the-counter remedies include saline nasal drops, decongestant, a vaporizer, or a warm compress to ease any pain or pressure. Sore, scratchy throats are a common symptom of many illnesses, but strep throat is a bacterial infection that, left untreated, could lead to more serious complications. Strep is a common illness in childhood and is quite contagious. Symptoms include swollen tonsils, red spots on the roof of the mouth or the back of the throat, fever, throat pain, or swollen lymph nodes. Although strep throat itself isn't dangerous, it's possible for the infection to spread and cause complications like scarlet fever, rheumatic fever, or kidney problems. If you have symptoms of strep throat that worsen continually for a few days or have difficulty breathing or eating, it's best to see your doctor. A doctor can diagnose strep with a quick test, and if it's found that you do have the infection, antibiotics can take care of it easily. 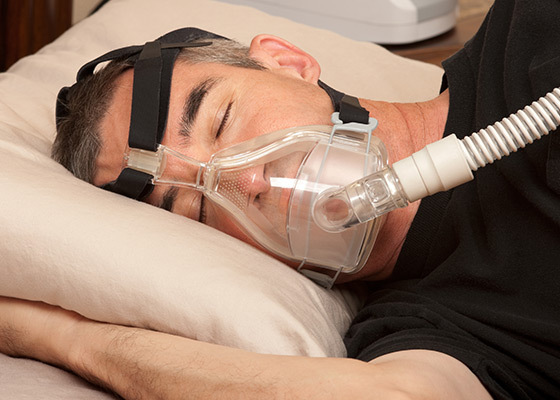 Sleep apnea is a sleep disorder where the patient stops breathing multiple times while sleeping. Often, breathing stops for a very short time (a few seconds or less), but this is enough to disturb the sleep cycle. If you snore loudly, wake up during the night gasping, or wake up in the morning feeling tired even after a full night of sleep, you may have sleep apnea. Though there are different kinds of sleep apnea, the most common one is obstructive sleep apnea. When someone has obstructive sleep apnea, the muscles of the throat relax too much during sleep, which makes their airway narrow or close as they breathe. When the person doesn't get enough oxygen, the brain senses this and wakes them, usually so briefly that it goes unnoticed. However, this pattern of waking and falling back asleep can happen multiple times in an hour, which means that people with obstructive sleep apnea can't get the deep sleep necessary for them to feel rested. Obstructive sleep apnea is more common in obese people, men, and people with thicker necks. A family history of the disorder can also put you at risk. A sleep study can help diagnose sleep apnea, and if it's found that you have it, your doctor might recommend that you try to lose weight or quit smoking. If these solutions don't work, a special machine or appliance can be worn during the night to make sure that you get enough oxygen. Surgery is also an option to remove or shrink some of the tissue that causes the throat muscles to relax. At some point in your life, it's likely that you'll experience on of the above conditions. If you're having ear, nose or throat problems that last for more than a day or two, or include symptoms that are keeping you from engaging in day-to-day life, schedule an appointment with your ENT as soon as possible. At C/V ENT Surgical Group we always use the most cutting edge techniques and the best medical equipment to diagnose and treat each and every one of our patients. Aesthetic and functional concerns as well as compassion are of utmost importance to our physicians and by the end of your experience you’ll see why we’re consistently rated the best ENT doctors in Los Angeles.